Need cost-effective, reliable hubs for your network? The virtue of our hubs is to extend a 10BASE-T system beyond two nodes or to increase network distances beyond the 100-meter segment limit of the 10BASE-Tspecification. To maximize distance, the typical network uses twisted-pair wiring for the end devices and fiber cables for the inter-hub links. Each twisted pair can be as long as 100 m and the total length of inter-hub fiber can be as much as 2000 m. The network diameter cannot exceed 2400 m. In a shared Ethernet environment the length of each fiber segment depends upon the number of hubs used. 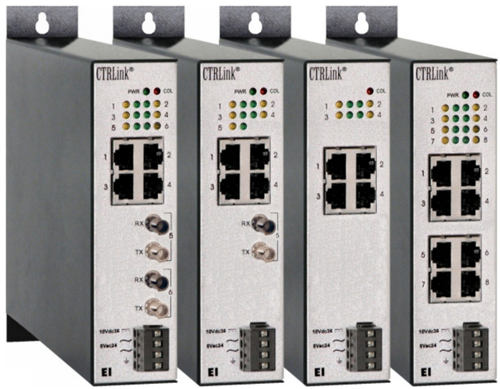 Two EI Series models provide expansion through twisted-pair cabling — the four-port EI4-10T and the popular 8-port EI8-10T. The line is enhanced with its fiber optic versions — the 5-port EI5-10T/F and the six-port EI6-10T/F. The EI6-10T/F has 4 ports for twisted-pair that support the signaling standards of 10BASE-T and the two fiber ports support the 10BASE-FL interface using ST connectors. The EI5-10T/F has one less fiber port. Fiber optic segments make it ideal for building control and industrial control applications where distance and robustness are important. Fiber optic links also provide a layer of isolation and increased immunity to electrical noise and other external influences usually encountered in an industrial environment. The EI Series follows the standards for IEEE 802.3 repeater units. These standards include preamble regeneration with symmetry and amplitude compensation. Repeaters must retime signals so that jitter, introduced by transceivers and cabling, does not accumulate over multiple segments. These devices detect runt packets and collisions and react by generating a Jam signal. They automatically partition jabbering ports to maintain network operability. All hubs provide digital pre-emphasis to transmitting ports to compensate for the inherent signal strength roll-off of twisted pair cable. Shielded RJ-45 connectors accommodate either UTP or STP cabling. The Link Integrity function is supported — confirming that a functioning adapter or hub is on the other end of the segment. Hubs can be cascaded using a crossover cable. For more accurate troubleshooting, the EI Series incorporates LED indicators. Besides one common Collision LED, each port has a pair of LEDs to indicate link status and port activity. All units operate from a wide-range, low-voltage AC or DC power source. Provisions exist for redundant power connections. Please contact your regional office for replacement options.